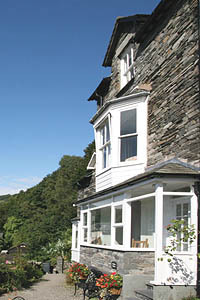 This traditional Lakeland house, on three floors, is literally a stone’s throw from Ambleside’s plethora of shops, pubs and eating places. It has been completely and sympathetically modernised and refurbished using high quality fittings and furnishings throughout and is personally maintained by the owners, Steve & Helen Metcalfe, who live locally and are on hand to offer any help or advice you may need. There is private parking one minute’s walk from the door (no car access to the house). 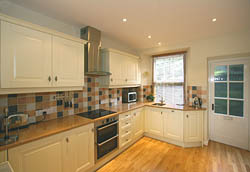 On the ground floor are the spacious kitchen and separate dining room, with access to the rear of the house. The lounge with TV and DVD is on the first floor, also the double room. 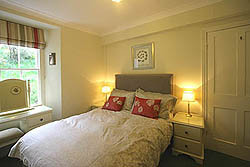 The master bedroom (en-suite, king size, convertible to twins, with TV and DVD) is on the second floor, also a single room. A suberb bathroom with bath (shower over), WC and wash basin is located between the first and second floor. To the rear of the house is a sloping garden with an idyllic level patio area. The house is open all year, bookings from Sunday to Sunday. Weekly rates for 2015 are from £460 – £840, fuel, bed linen and towels included. We regret no pets. 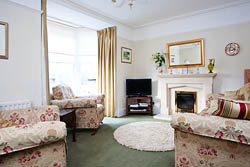 For bookings, availability and further information, please see our WEBSITE at www.amblesideholidayhomes.co.uk or phone 015394 32392.